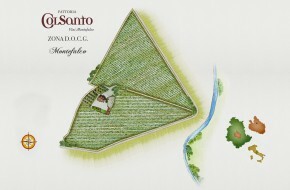 Vineyards: located at Montarone in the municipality of Bevagna. It has an intense ruby red color. Its bouquet is fruity. Well bodied, on the palate its tannins are soft and the aftertaste is long. The grapes are harvested at the beginning of October by hand using boxes, followed by gentle destemming. The fermentation takes place at a controlled temperature of 23°C on the skins for fifteen days. This is followed by the malolactic fermentation which takes place 70% inside wooden barrels and 30% in steel tanks. Maturing lasts 15 months and this also takes place 70% in wooden barrels and 30% in steel tanks. At the end of this period, the wine is assembled and bottled. There follows a further period of refining in the bottle. Drink with: matured cheeses, grilled meat.